In this week’s blog, we will look at some ways to engage the audience on our Business Facebook Profile page and some best practices. Let’s get started then! One of the ways to make your page more engaging is to “Pin” the most important post on top. This necessarily means that when a user lands onto your business page the “Pinned” post is the first one that he sees. You can keep adding other posts but the “Pin” makes sure that this post is always the first on your page. 1. You can use this feature to ensure that if your page has information about your products or services that you want to be highlighted to any audience landings onto your page they can check it out at the start by pinning that specific post. 2. Any seasonal sales, for example, can be a valid post example that can be pinned so the audience landing on the page don’t miss it out. 3. Any Frequently Asked Questions can be listed out, created a post off and pinned to the top so the audience can educate themselves regarding your brand/business. 4. Any housekeeping rules regarding commenting language can also be pinned to the topmost to make sure that the user reviews are legible. 5. Listing down your products if you deal with specific ones is also a great use of “Pin” post so the audience immediately notices your products rather than get lost in all the clutter on the page at 1 place. How to Pin a post? Now that you know how to use it lets learn how to Pin a post on our business profile page. 2. Once the Post is published on your page scroll to the left-hand side of the post and you will find a small arrow pointing down. 3. When you click on it you will get options like: “Edit”, “Delete” and also “Pin to Top of Page”. 4. Click on Pin to Top and the post will be pinned to the top of the page with a small pin icon to the left side of the post which is to confirm that the post has been successfully pinned. One of the features now available on Facebook is Facebook Live, which gives you an opportunity to live stream to your audience from your Business profile page. This is similar to Youtube Live if you have worked with it in the past. 1. Showcase your work or products for example: if you are an event management company or a fashion boutique. 3. Educate your audience regarding your brand/business by having a face to face chat. 4. Also one of the best things about Facebook Live that I personally like is this video chat is then saved amongst your business posts so even if the audience is not present when your life they can come back and revisit this chat and engage with it later at their convenience. 1. Now that we have explored how Facebook Live can be useful for us let us learn how to use it on our page. 2. Its very easy and is present right at the top of your profile amongst the types of posts that can be used to post on the page. 3. In the below screenshot “Live video” depicts “Facebook Live” with the small video icon beside it. Audience Optimisation for posts is a feature that Facebook has provided on all profiles so your posts on your page can be inadvertently be displayed by Facebook to the audience on its platform that might be most interested in it. This feature allows you to define the ideal audience for your page using parameters like: Age, Demographics etc. so that Facebook can optimise and try to deliver your posts in their newsfeed or right side columns. This feature is found in “Settings” and in the “General” tab under “Settings”. 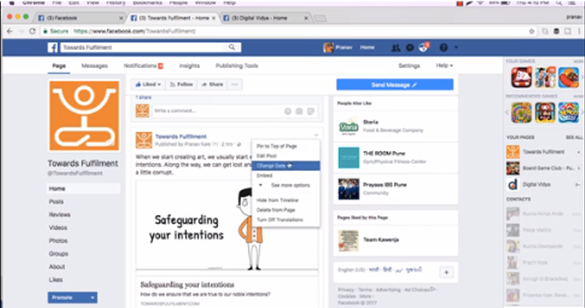 You can use up to 16 predefined tags to mention to Facebook your ideal audience’s interests. This ensures that the audience most likely to find your information interesting or worthwhile will have access to it and others who might not be ideal for you will not be shown your page and information. USP & Target Audience – What they mean and how to map them? To get a customized Facebook Marketing strategy for your brand reach out to me on sirisha@brandingbypixels.com.